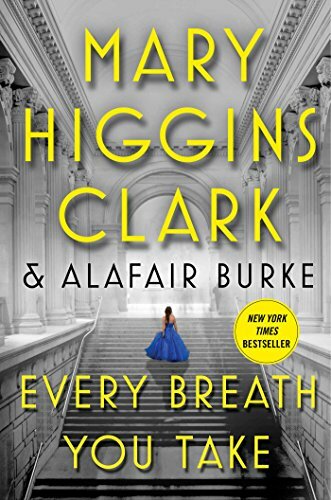 In book four of the Under Suspicion series, Mary Higgins Clark and Alafair Burke take the reader on another gripping journey with Laurie Moran, star of the reality TV show Under Suspicion. She and her investigative team search for answers to a murder that happened three years prior at the Metropolitan Museum of Art's annual Gala Celebration. Socialite Virginia Wakeling, a member of the board of trustees is discovered dead in the snow after a fall from the museum's rooftop. In the years since her death, no one has been charged and speculation abounds as to if the elderly woman was pushed or if she took her own life. Virginia, dating Ivan Gray, a man more than 20 years her senior, and to whom she fronted funds to establish his now successful gym, PUNCH, as well as presenting him with a Porsche, have Virginia's daughter, Anna and her son, Carter, as well as Anna's husband, Peter Browning believing Ivan to be the killer. They hypothesize no one else could have been responsible but him, claiming that though Ivan insisted he and Virginia were to be married, they believed Virginia came to her senses and was ready to turn Ivan loose. After all, why would he be interested in a much older woman if not for her fortune? Laurie worries about delving into this case, though cold cases are the crux of her program. She is unhappy that her new legal host, Ryan Nichols, whom she believes to be aloof and arrogant, is who pushed this idea through to her boss. She is still mourning her breakup with the former host, Alex Buckley, but has no choice but to proceed. In addition to Ryan being in tight with the studio management, he also is friends with the personal trainer, determined to prove his innocence. Interviews are arranged with Wakeling family members including Virginia's nephew, Tom. Patriarch Bob Wakeling and his brother started their real estate enterprise many years ago but had a falling out and Bob bought out his brother's interest. Virginia had no love lost for Tom, believing him to be a ne'er do well who was a gambler and womanizer. Yet after her death, Anna, Peter, and Carter took him under their wing and into the business where he appears to have matured. "Laurie felt like a coach in the locker room as she stood at the whiteboard in her office, marker in hand, while Ryan, Jerry, and Grace were gathered at the conference table in front of her. "'As always, we go on with open minds, but we've got two leading suspects: Ivan Gray and Carter Wakeling.' She circled both names on the board. Jerry had done phenomenal work over the past five days. They had a complete production schedule already nailed down. This team meeting was to go over final details and make sure Ryan was prepared for interviews. "'The case against Ivan is essentially the same information that led police to suspect him in the first place.' Ryan's Harvard-trained legal mind was evident as he quickly listed the details: the age difference between him and Virginia, his financial motivation to seek a relationship with her, and, most important, the absence of any corroboration that Virginia had known about the half million dollars transferred from her accounts into Ivan's gym. But even though Ryan had clearly mastered the facts, Laurie could tell from his dismissive tone that he was not taking the evidence against his personal trainer seriously. She decided to keep her thoughts to herself for the time being." Several colorful characters are introduced including Laurie's original teammates, Jerry and Grace. Their distinct personalities blend and contrast to make the tension between them more powerful. We are privy to the lives of the rich and famous only to discover they have skeletons in their closest the same as ordinary folks. The suspense builds up until the somewhat surprising conclusion.